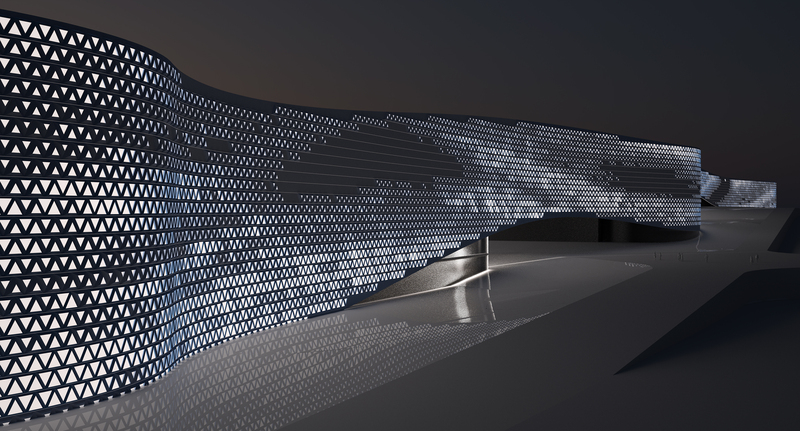 OCEAN CN aims to conceive and deliver unique architectural spaces, by innovating standard structural, tectonic and material systems with design method, linking digital generative design, production, manufacturing and assembly. OCEAN CN applies its range of experience in architecture, interior conversions and fit-outs, material development and furniture, towards the design of prototypical environments, which are both locally specific yet globally significant. This 120,000m2 project for a wholesale mall comprises a vast interior for wholesale shop­ping, offices, and a car park. The entrances from the main thoroughfare is fronted with a 600m long wall which is the design remit of OCEAN CN. In this early stage of design, three schemes are being considered as a visual screen of the car park and delivery area. The limited variation of components define a porous screen which, combined with applied colours and patterns, lighting and incorporated advertising, create a striking graphic and spa­tial identity for the project. The project is at the early stages of sketch design. OCEAN CN & SED Landscape Architects team up for a Joint Venture for this International Competition to design and Urban Park in Shenzhen. The urbanism of Hong Kong is shaped by cacophonous collages of homogenous, standardized, and generic arrays of uniform buildings. 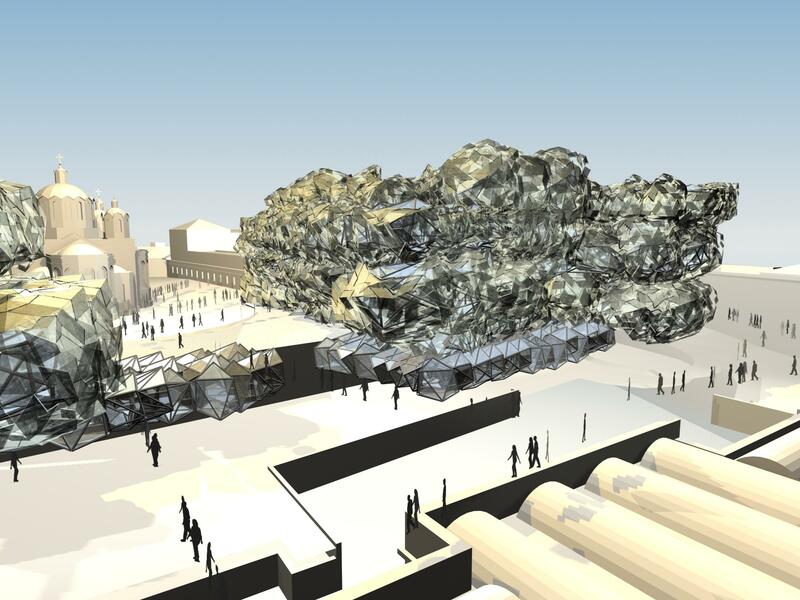 Confronting this paradigm, we have developed 3-D computational model environments, with which to generate differentiated yet coherent iterations of urban models. 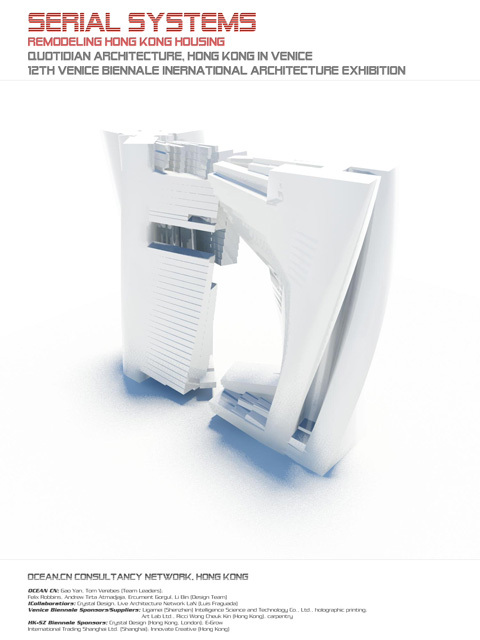 Through the coding of these programmable models, the design team engaged with the principle of optioneering a vast multitude of possible design options at the scale of urban design and masterplan­ning. Nine standard housing plan types have been developed and transformed in the design process, generating a range of sectionally differentiated topological spaces, through parameters of density, proximity, height, and the formal transformation of floor plates. Lastly, a user interface associated and linked to control the various digital modeling environments has been developed, as a prototype for collaborative engagement to be used by architects, planners, investors and the public in the briefing, design and updating of adaptable three dimensional masterplans. This proposal for the Masterplan distributes a multiplicity of graphic spatial systems, derived from transformations of traditionnal Chinese patterns, forming arrays of surface bands, point clouds and spiraling fractal lines. 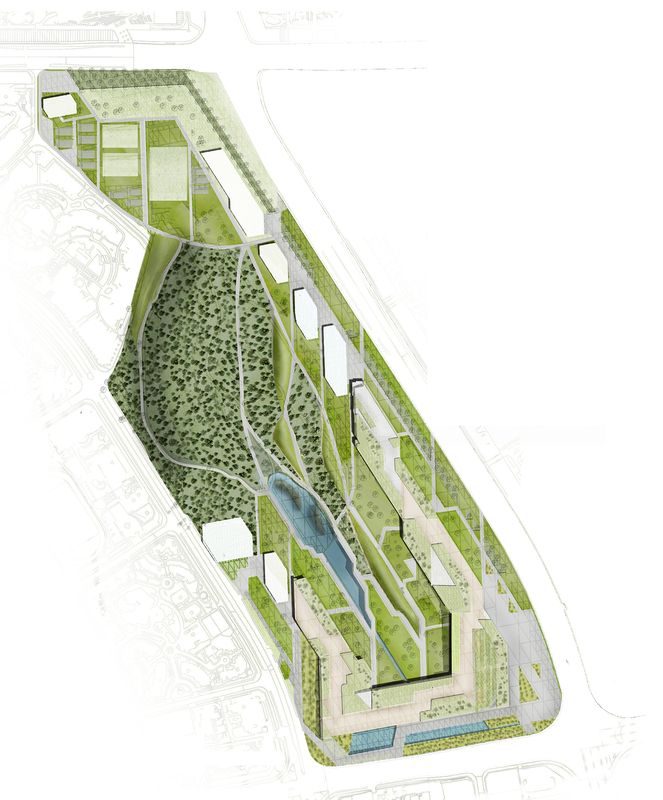 The systems deploy soft landscaping, hard landscaping, pedestrian and service routes, and facilities across the site. Each spatial system is operated upon with forces simulating earthquake forces and effects on the ground. The result is a space, achieving an urban density to the park, with a coherent yet diverse spatial organization, and a central area which serves as a monument to the Earthquake, and also locating the Museum building. The ruins are encircled with a pedestrian route, enabling people to look at the ruins in a safe yet proximate vantage. This competition proposal aims to internalise the public realm of everyday urban movement, experience and behaviour, shifting the Academy’s constituencies towards the broader public. Four spinal blocks are connected along the east side of the site, and internally via the lower ground and basement levels underneath the public plaza. Each department occupies one of the bar building on each floor, while atrium holes for visual communication between departments permeate the porous building from roof level downwards, and the canyons between the two pairs of bar buildings. A repeated series of spatial modules are differentiated in 3d arrays, configuring the cellular space of the building from the simple repetition of 4 sizes of cells and their rotation and translation relate to each other. Situated in a 800 year “white village” in Andalucia, Gaucín is comprised of traditional low rise village houses, clinging to the contour lines of the mountainous terrain. The site has a courtyard and outbuildings, which are part of a planning permission to build a 4-floor villa, with a swimming pool and terrace on the roof, overlooking the Mediterranean and the Rif Mountains of Morocco in the distance. Limited by Planning regulations to have windows on only two sides of the four-sided building, a complex set of light-wells and atria bring daylight down into the lower floors of the house. The Mountain Hut is a small scale, pre-fabricated, demountable and re-assemblable pavilion designed for two extreme topographical contexts ¬ Palisades Glacial Park in northern California and, adjacent to the Machu Picchu Inca ruins in Peru. The sustainable roof is generated via particle dynamics software, simulating gravity and rainwater flowing to internal nodes, and its intelligence is in relation to environmental performance criteria: harnessing sunlight energy, water, and natural ventilation. An EPDM-Photovoltaic fabric is embedded into the roofing membrane, formed from ferro-cement composites with Curv. The roof is perforated with two systems of openings, ‘zippers’, and ‘eyelids’, organised along a radial network. In each ‘eyelid’are photo and heat-sensitive gels acting as optical shutters, that passively react to heat or direct sunlight by changing phase states of colour and opacity values to provide interior shade and insulation. The manually operable ‘zippers’ open for light and ventilation, with an outer rubber gasket and an inner zipper mechanism. Built as a tourist and leisure facility, the Hut distributes information, shopping, restaurant, and between 20 and 80 stackable sleeping units, re-organised to seasonally fluctuating demand. The brief of this design commission is the remodeling of a penthouse loft of a 1950’s industrial building in Farringdon, London. The clients collect Op-Art paintings by Bridget Riley amongst others, and the organisational patterns of are generated from similar mathematical patterns, producing a range of optical effects on a three-dimensional stair, glass treatment, bespoke wallpaper and a dynamic floor pattern. In addition, a new kitchen will be installed, and the bathrooms will be remodelled. 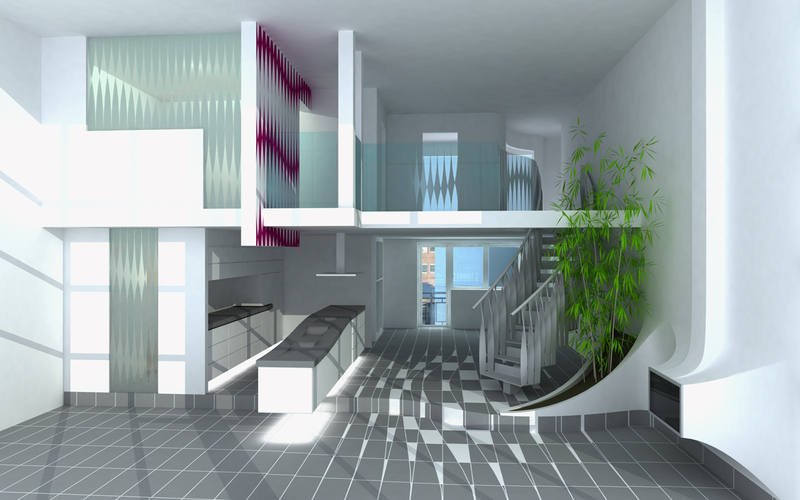 Significant structural works will be carried out to install the new stairway to the mezzanine, where an informal office mixes with living space. This project proposed to remodel the interior of a late modernist ski chalet apartment on the slopes of Mont Blanc in Chamonix. All interior walls are removed to open the 55m2 interior as a landscape of various built-in furnishing elements, applying advanced computer aided off-site manufacturing technologies. 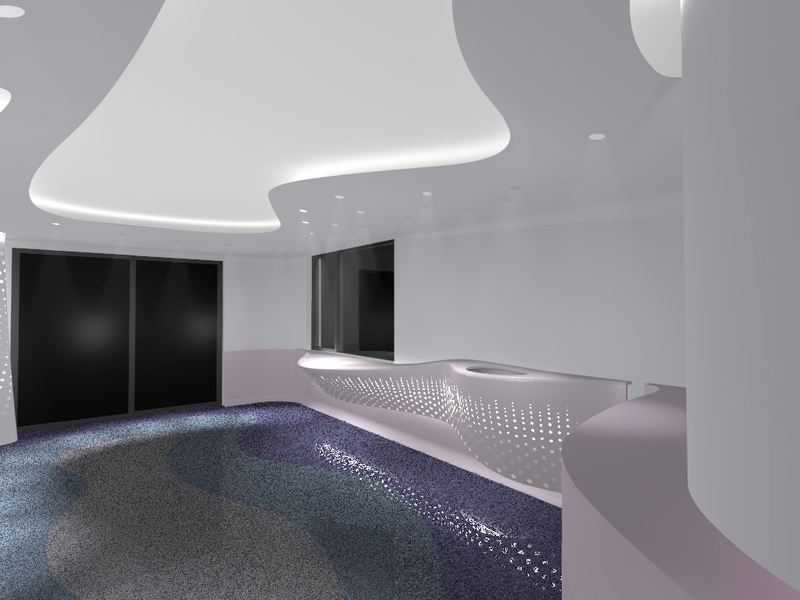 Intelligent and interactive lighting systems will be emebedded in column and wall surfaces, and be linked to a seating area milled from soft polyeurethene foam and coated with latex, recording the history of use in the flat, in relation to lighting adjusted in real-time to exterior environmental conditions. 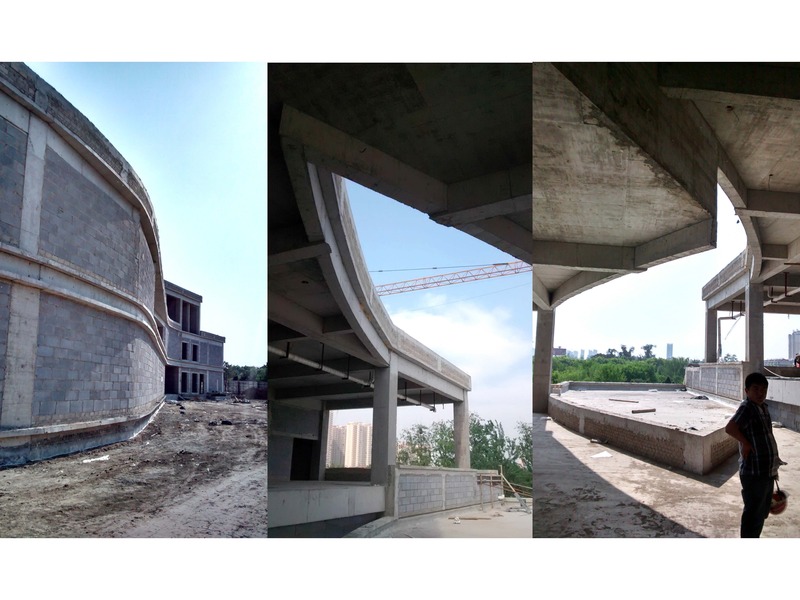 Three dimensionally curved tectonics are articulated in Corian, cnc milling and more traditional plasterwork.